MacLeod Builders is a proud supporter of local initiatives. The Shakespeare Company is Calgary’s lean and mean classical theatre company, highlighting the best of the Bard in all his comedy, tragedy, and bawdiness. Since 1995, they have brought the Bard alive for Calgarians through both Shakespeare and Shakespeare inspired plays. The Shakespeare Company is committed to making Shakespeare accessible through innovative performances and inspired directing. We are so excited to be a part of the Calgary Folk Music Festival for 2018. Find us in Sponsorship Alley! We can't wait to see you there. The MacLeod team was thrilled to build the new boardwalk at Hillhurst Elementary School. This provided safe access from an area that was constantly flooded due to natural grade. 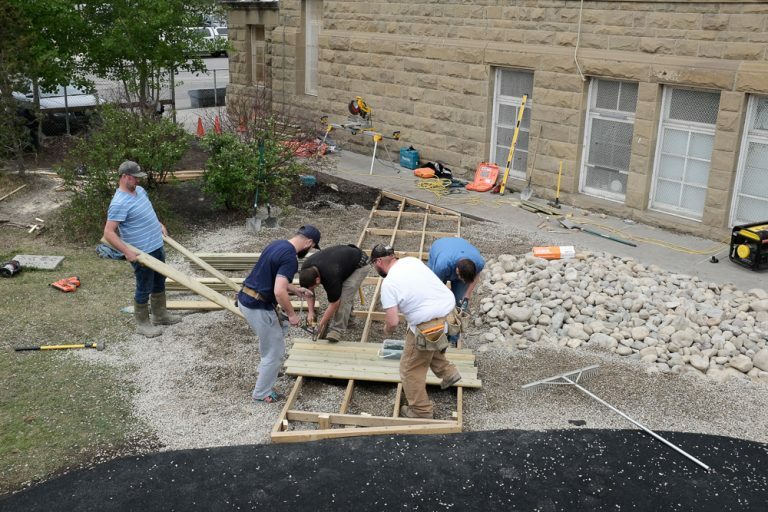 MacLeod came up with a solution that connected the paved sidewalk to the newly installed playground. The MacLeod team was excited to take part in the creation of an 8-foot tall maze made completely out of re-purposed bottles, right in the middle of Eau Claire Market. Working with Calgary Can, an organization dedicated to reducing waste and improving recycling opportunities by collaborating with the bottle picking community, MacLeod helped bring this initiative to light. In addition to working with Calgary Can, Mckinley Burkart and Entuitive Engineer Consultants were large partners in bringing awareness to local recycling initiatives.